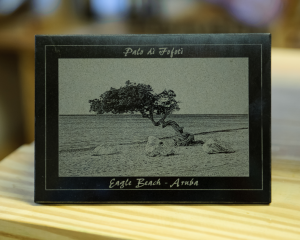 For engravings on Tiles we offer 3 different possibilities. We have different sizes and shapes of Black Granite Tiles on stock. These produce a very nice contrast when engraved. Further we have white 11 cm x 11 cm Lasertiles. These are specifically made for Laser engraving. The Laser produces a very clean balck engraving. If you have a another tile that you would like to engrave (e.g. a house number) please bring a sample to the shop and we will check the possibility of a custom engraving.